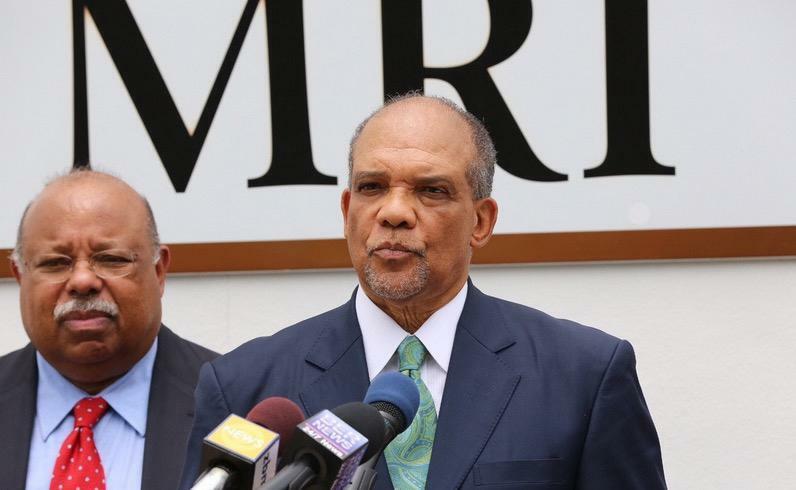 Dr. Ewart Brown, the former premier of Bermuda and founder of Bermuda Healthcare Services, said the charges against hmi are racially motivated. Angeles’s poorest neighborhoods was out of reach. That stark portrait eventually led Brown to a partnership with Lahey Hospital and Medical Center — one that is now the subject of a civil racketeering lawsuit that has uncovered a little-noticed relationship between the Burlington-based hospital and the small British territory. In Bermuda more than two decades ago, Brown said, he found that the latest mammography technology was not available and there were no specialists in rheumatology, neurology, or pulmonary services. Determined to forge a relationship with a hospital whose specialists would travel to Bermuda to treat patients, Brown said, he visited facilities in Florida, Atlanta, and New York. Then, a chance encounter with a doctor from Lahey at an allergy conference led him to strike a deal with the hospital in 1996. Bermuda has filed a federal lawsuit accusing the Burlington-based provider of bribing a former prime minister in order to secure business. The arrangement, which spanned two decades and encompassed Brown’s tenure as Bermuda’s premier from 2006 to 2010, is now at the center of the lawsuit that accuses Lahey of paying Brown bribes, disguised as consulting fees, to secure health care business on the island. Both Lahey and Brown have denied the allegations in separate statements. On Saturday, in a telephone interview from Turks and Caicos, where he lives part of the year, Brown, 70, spoke at length about his business relationship with Lahey, as well as the political and racial tensions on the island. Brown acknowledged that he was well-compensated by Lahey, but said the payments were for services he provided under a contract that was scrutinized by the hospital to ensure compliance with US and international regulations. “When you take a contract that has been fully vetted and stood the test of time for 20 years and call it a bribe, that’s insulting,” Brown said, disputing the government’s claim that he failed to disclose consulting fees from Lahey during his tenure as premier. When Lahey signed the contract with Brown in 1996, the hospital was not popular in Bermuda, according to Brown. “My job was to create the Lahey culture in Bermuda, to bring doctors down, send patients up, and create an axis of excellence between Bermuda and Lahey,” Brown said. Lahey ended its consulting relationship with Brown in 2015, but continues to provide tele-radiology services to his clinics and interprets scans. It also sends a rotating group of cardiologists, neurologists, orthopedists, and other specialists to Bermuda, but rents space in doctors’ offices and at the government-run King Edward VII Memorial Hospital. Brown described the lawsuit as racially and politically motivated, and he accused Bermuda’s attorney general of targeting him because he’s a successful, black businessman aligned with the opposition party. Moniz declined to respond through Liberty Square Group, a Boston public relations firm working with Cooley LLP, the law firm representing the Bermuda government in the suit. Earlier this month, Brown’s two clinics were raided by the Bermuda Police Service. One of the doctors who works for him was arrested but has not been charged with a crime. 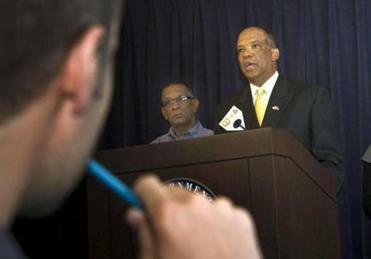 Brown has also not been charged, despite a six-year police investigation into his tenure as Bermuda’s leader. Yet he said he is bracing for the possibility he could be arrested when he returns to Bermuda next week. The government’s suit alleges that after Lahey secured contracts to interpret MRIs and CT scans performed at Brown’s two clinics on the island, both parties reaped hefty profits by ordering thousands of unnecessary images. Brown denied the allegations and said that patients had to wait weeks for scan results at the government-operated hospital before Lahey’s involvement, which provided results within a day. Scans in Bermuda are ordered based on standards set by the American College of Radiology, he said, and the country’s rates are well below those of the United States. “From a medical standpoint, Bermuda would be justified in having more [scans] than the US,” said Brown, who described the island’s population of 65,000 as aging and sickly. Bermuda has among the highest per-capita income in the world, but its population has long struggled with traffic accidents and persistent health issues, including diabetes and obesity, according to public reports. A government analysis in 1996 — about the time the Lahey relationship began — said that Bermudians’ access to primary and specialty care was too limited, and wait times too long. A separate 1999 survey found that half of Bermudians were above a healthy body weight, and one-third were obese, due partly to poor diets and limited physical activity. The island still lacks some specialty services. For example, a radiation therapy center for cancer patients is slated to open later this year, a collaboration with local health care providers and the Dana-Farber/Brigham and Women’s Cancer Center. Currently, cancer patients leave the island for radiation treatment. Brown also refuted the lawsuit’s claims that he and his wife, Wanda, purchased a $3 million property on Martha’s Vineyard with payments he received from Lahey. He said his wife is a successful investment banker who owned property in Oak Bluffs before they married in 2003. Seven years later, she bought the new home after selling the other one. Wayne Budd, a former associate US attorney general, said he has known Wanda Henton Brown since they worked at the same law firm in Boston in the 1980s and often socializes with her and Brown on Martha’s Vineyard. Brown said his desire to be a doctor was sparked when he was 11 and worked weekends cleaning the office of his uncle, a well-known physician in Bermuda. He also comes from a family of politicians, including his mother and four other relatives who served as members of Bermuda’s Parliament. He was practicing medicine in South Central Los Angeles before he returned home to Bermuda, and, in 1993, opened his first clinic, Bermuda Healthcare Services, and won a seat in Parliament for the Progressive Labour Party by upsetting an incumbent in a close race. “Without detracting from good doctors, Bermuda was considerably behind the times,” said Brown. While attending an allergy conference in Florida, he was impressed by a presentation by a Lahey doctor, who suggested he bring his idea to the hospital’s chief executive officer. Brown said he arrived in Lahey’s Burlington headquarters with a sketch, showing a doctor with one foot in Bermuda and the other on the East Coast, sparking laughter when Lahey’s chief noted that the foot looked closer to Johns Hopkins Medicine in Baltimore. “I can’t remember another contract vetted as strenuously as the contract with Lahey,” Brown said. Shelley Murphy can be reached at shmurphy@globe.com. Follow her on Twitter @shelleymurph. Priyanka Dayal McCluskey can be reached at priyanka.